Disclaimer: No person is less than who takes prescription medications whether that be for pain, depression, anxiety or an illness. This is in no way an influence for you to stop taking your medications. You must always consult with your doctor and make your own decisions as a human being. I can not prevent, cure, diagnose, treat or prescribe any medication myself. All information below is based and referenced with tested information followed by my own opinions through intensive studies. In the modern western world the term "pills" tends to be in our daily vocabulary. You hear it from your grandparents, your parents and maybe even your friends. Typically it's about either needing to take, forgot to take or needing to go pick up their prescription at the pharmacy. According to the CDC, from the year 1999 to 2014 the sales of prescriptions drugs nearly quadrupled and most Americans reported that no change in their pain, anxiety or depression occurred from these pharmaceutical drugs. The purpose of this information is to educate you on the possible and factual dangers that have and can come from taking pharmaceutical drugs of any kind. Unfortunately in America our doctors have been trained to mask the issue and not get to the bottom root and cause of an issue or treat the body as one whole working system. Modern medicine has come a long way when it comes to now having cures and groundbreaking diagnosis strategies for different ailments. However, what appears to lack is a thorough understanding as to why the body is reacting the way it is, and how an issue arose in the first place. In Herbalism and especially Ayurveda, educators believe that the core of one's health starts in the gut, and when one part of the body is out of balance, so is another. Our bodies are one whole working system, homeostasis. So, when we struggle with "x", it's mostly due because of "y" and it's throwing off "z". The goal is to start with "a", which is preventive care but if we already feel like we are at the end of the line, we can still get ourselves back to the beginning where we can continue on a path of healthy vibrant living. I believe that more than ever the world needs health coaches, practitioners, and educators. I strongly believe that when we have a relationship with our coaches and practitioners, only then are we going to be able to have a better relationship with our bodies and then be able to have the proper conversations with our primary care physicians. Herbalism is a practice of using plants to nourish, promote, expel and support different ailments that happen within or surface the body. Excitingly, herbalism is practiced with a traditional form of healing like Chinese Medicine, Western Medicine, Graeco-Arabic Medicine or my prefered method, Ayurveda; which is actually the system of healing that has inspired most traditions. You can even go a little deeper and have a supporting method of healing through Astrology, but it depends on the herbalist itself. At the end of the day, all traditions have a goal of supporting an issue, but unlike Western Medicine, older traditions have the commonality of treating the body as a whole working system. An herbalist is a trained educator who has gone through extensive studies and practices to teach, educate or become a clinical practitioner to help others find balance in their life using herbs and healthy lifestyle practices that compliments a person's constitutional makeup. Even deeper, herbalism is more than herbal support. It's about outside practices, nutrition, and mental awareness to our inner and outside consciousness. The key to experiencing success through Herbalism and Ayurveda is by having interconnectedness among ourselves and the universe. This trickles deeper into emotion, elements and energy. There is no quick fix or magical pill that will mask or take a problem away, but rather a tailored plan for each individual's constitution. The primary focus is to treat clients as individuals and to stimulate their bodily functions through the use of holistic interventions. To the contrary, western physicians take on diseases by using strong chemicals that are difficult for our body to process. This ignores the unique makeup of the individual, but many patients under conventional care suffer from side effects that are just as bad as the condition being treated. When our mind, body and soul are speaking together and working as one with the use of natural, holistic practices, then our whole being will respond with positivity and openness bringing us back to our conceived state of being. Our prakriti. Herbal pastilles are one of the easiest ways to take in the medicinal value of herbs. I'd say it's right up there with tisane infusions and tinctures. Electuaries are made up of only two ingredients. Yes, two. Well okay unless you decide to do an herbal blend but it's really just honey and your powdered herbs. Electuary in its truest form is a silky paste typically kept in a jar and used by scooping out a gollop and either consuming it directly or stirring it right into a warm drink. This type of herbal concoction has more honey than it does herbs, hince the silky consistency. 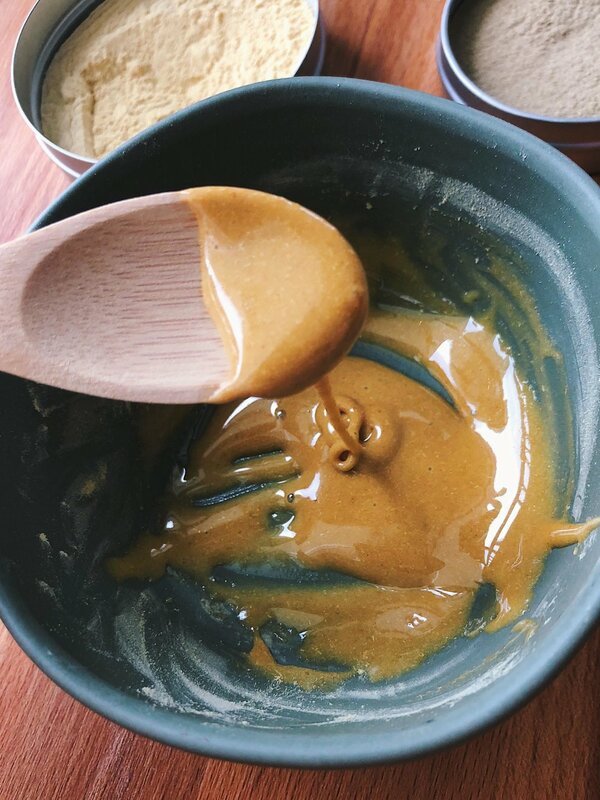 On the other hand, you can create the exact same thing but instead of more honey it's more herbs and it creates a dough like consistency and you can then roll it into little pastilles. Electuaries are extremely fun, simple, delicious and popular with kids. Especially if you have a hard time getting them to take a glycerite tincture. The herbs you use are completely up to you and both types of electuaries can be taken in whole form or stirred into warm milk, coffee, tea or soup. Note that children under one should avoid honey. The type of consistency you would look for in a traditional electurary to jar up. Except you would want 10x's the amount! Reminds me of almond butter! The type of consistency you would look for in an electuary dough before you start to roll it out into pastilles. Mmm, looks so delicious! How your dough should look freshly rolled in the palm of your hands. Once you have your powdered herb(s) ready to go place half of your herbal mixture in a bowl and the other half in the second bowl. One of these bowls will be used for mixing and the other will be used for the final powdering process. I love creating herbal medicine using the folk method, which really is just going with your intuition and not measuring, which I suppose is never ideal for anyone not doing this for the millionth time but... I have faith in you! Next, grab your honey and start slowly adding it into one of your bowls and mix with your spoon. I recommend starting out light and adding more when you feel like it's needed in order to get to that doughy consistency pictured above. If you feel like you are having trouble getting to that consistency slowly add more powder. If for any slight chance you ran out of what powdered herbs you had on you and it's not thick enough to roll, don't throw your mix away because you simply made traditional electuary paste and it can be jarred up to be scooped out directly. No harm no foul, try again next time! Once you have your dough consistency and it's workable in your hands without completely sticking all over your hands start shaping it. I prefer rolling it in between my palms for a ball shape as I find making it into a "pill" form to be challenging to me, but really shape doesn't matter. Next place your pastille in your second bowl with the powdered herbs and shake it gently in there so your pastille is completely powdered. Doing this allows your collection of pastilles to not stick together when stored. I also recommend having fun with this last step. It does not have to be the same herb. Maybe it's cinnamon for your child so it taste a little better for them, or maybe you want to cover it in powdered matcha, coffee, lavender buds or mushroom powder. I get my mushroom powder from Four Sigmatic! Use code: sagedfibers to get 10% off your whole order! Ta-da! Make as many pastilles as you would like and store them in a container lined with parchment paper. It's recommended that you store your pastilles in the fridge and they will be good for 4 months, or you can freeze them and they can be good for 12 months. The dosage depends on the herb so be sure to do your research, but most popularly I take my shatavari electuary pastille once a day in my morning beverage, but again this can change depending on your herb or size of the pastille. Always be sure to consult with your doctor before using herbs while pregnant or breastfeeding. Place your dough into your second bowl of powedered herbs. Coat your ball all over in the herbal powder so your collected pastilles don't stick together. You or your child can take them whole or you can simply plop one in a warm beverage and stir until mixed thoroughly.